Today we are going to make a cold process soap with rose hip powder. This will be our coloring agent. 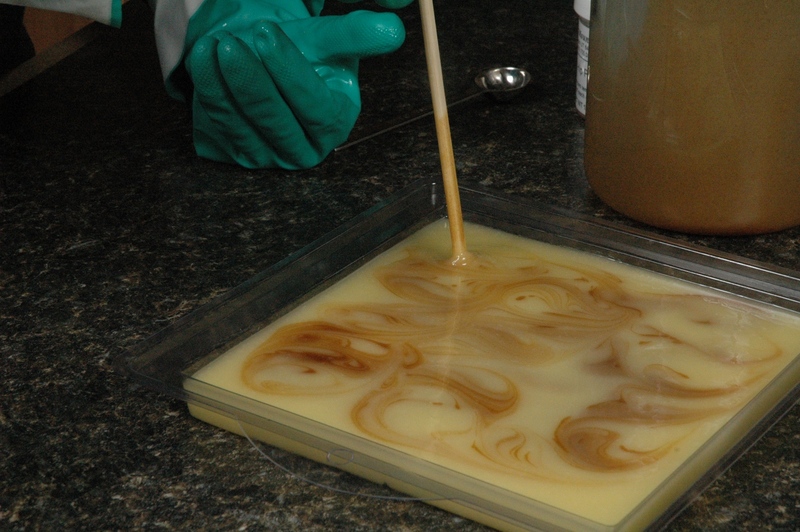 Let’s make our regular test batch type of soap. 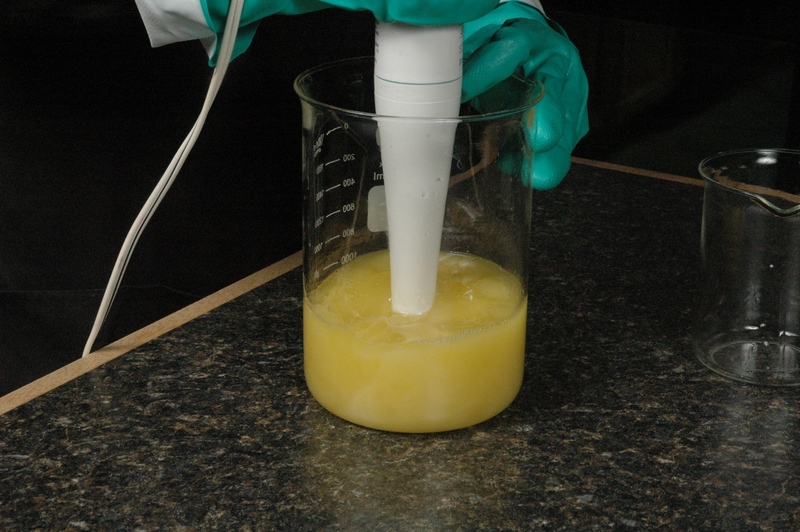 If you missed the original week of cold process testing, you should look here. 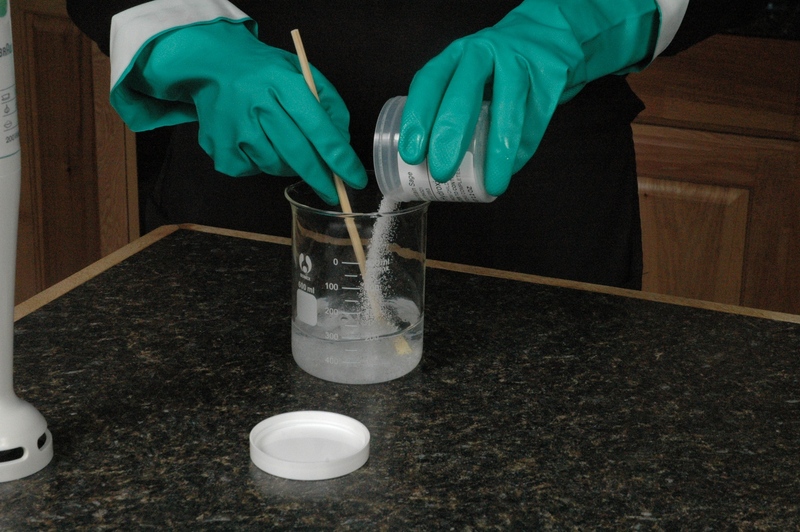 We are going to use the higher end of the water recommendations in the Lye Calculator so we can mix the powder in easily. 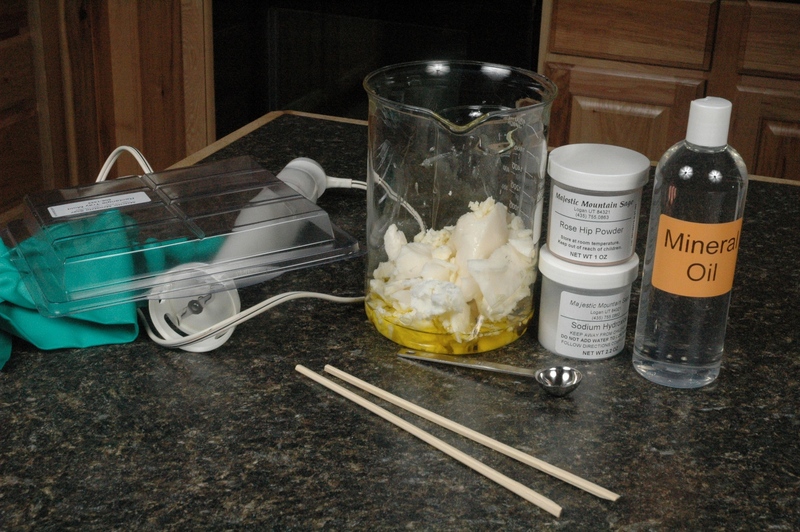 We are also making this soap in dry weather so the soap will dry/cure quickly. If you are making this in a humid location, please use a dehumidifier to help dry out the soaps. 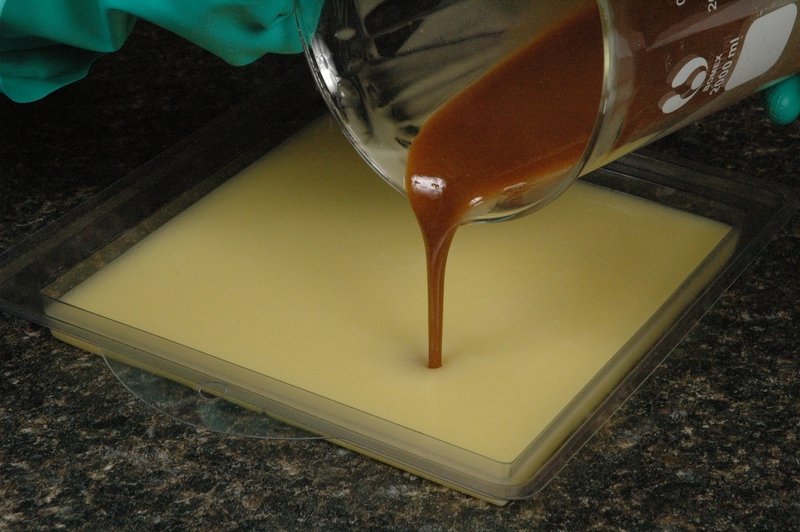 Pour the majority of the soap into the prepared mold. Leave about 1/2 cup remaining in your mixing vessel. Add rose hip powder and stir well. Dollop the colored soap on the white soap in the mold. Use a Q-tip or small painting brush to swirl. This shallow mold will have a better swirl with a stick that has some kind of texture to assist in spreading the colored soap. Think of this as more fingers to make the swirls. Place a heating pad on the counter. Set to low. Place a cake/cookie cooling rack over the heating pad. Set the mold on the cooling rack. Leave in place for about 2 hours. Remove the heating pad. We are providing a bit of extra heat because we received snow over the weekend and through the night. It is quite cool here. 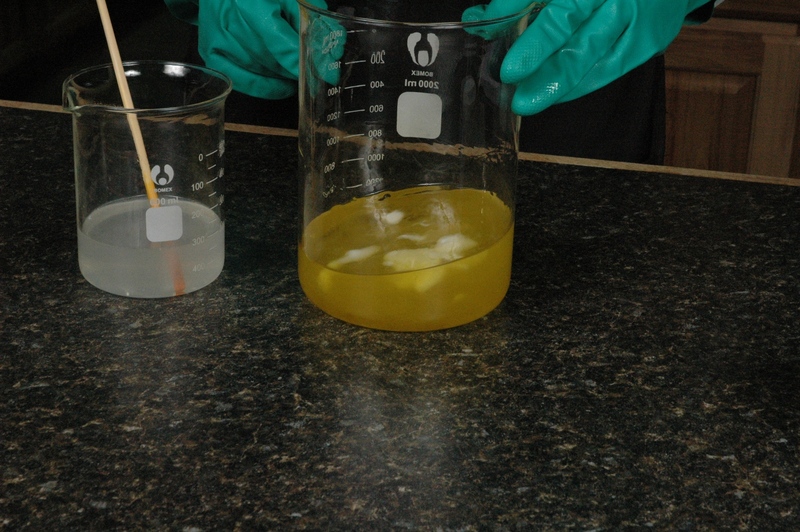 Instead of worrying about the soap losing all of its heat, we will add a bit of supplemental heat to make sure the soap will go through gel phase. In the summer time I would just turn off the air conditioner and allow the soap to stay warm. If you have curious cats or children, cover the mold with a box and check on it every half hour. If you have a house free of curious fingers, just leave the soap in the open. If you are concerned about any soda ash developing on the exposed surface of the soap, then cover it with Saran Wrap. We like this heavy plastic wrap because it doesn’t stick to everything in sight and require two people to place it. Uncover the soap in 24 hours. 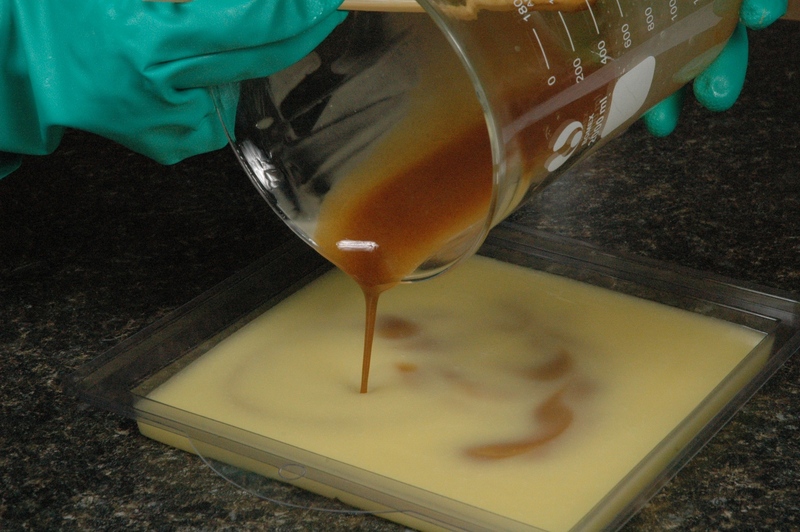 If the soap doesn’t want to easily come out of the mold then allow it to sit for another day. Dehydration is helpful to removal from the mold. Once the soap is in the mold for 48 hours, try to unmold. If the soap still doesn’t want to come out of the mold, then place the mold in the freezer. If the soap is extremely scented try putting ice in a cardboard box lined with a plastic bag instead. It is a difficult thing to explain to your family that the ice, meats, veggies and Popsicles taste like Patchouly. The goal is to make the soap cold, not flavor all the refrigerator foods. Freeze for about 20 to 40 minutes. 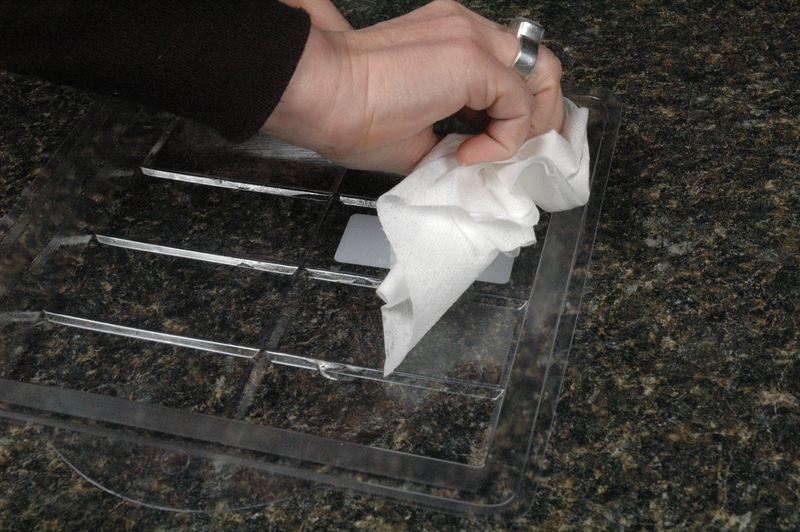 Remove the soap and allow it sit on the counter until the soap mold is sweaty with condensation. Press gently on the mold until the soap releases. If the soap is slow to release try freezing again. Patience is key. We find only a few soaps are this difficult to remove, but these difficult soaps can certainly try the patience of a good soapmaker. 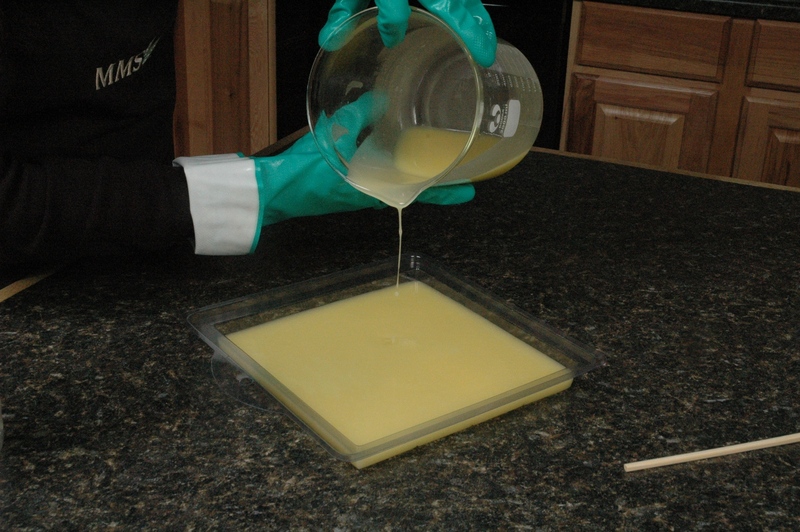 Your soaps, and soap molds, will appreciate the gentle care. 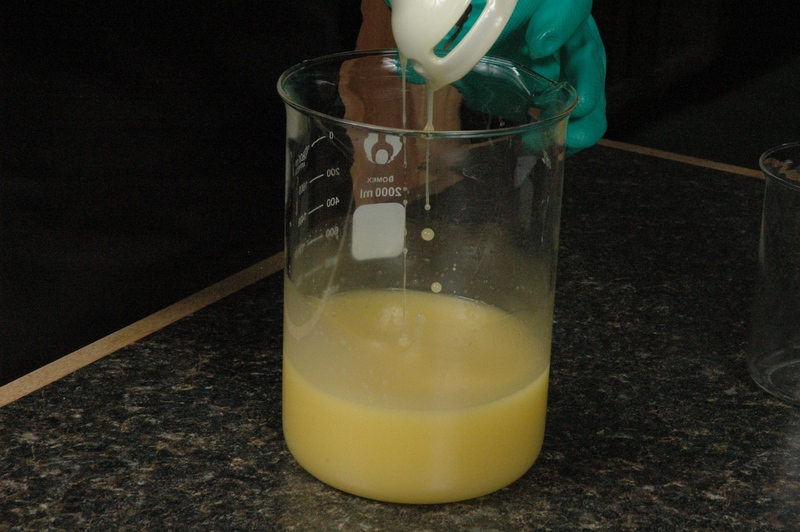 Coating the mold with mineral oil. 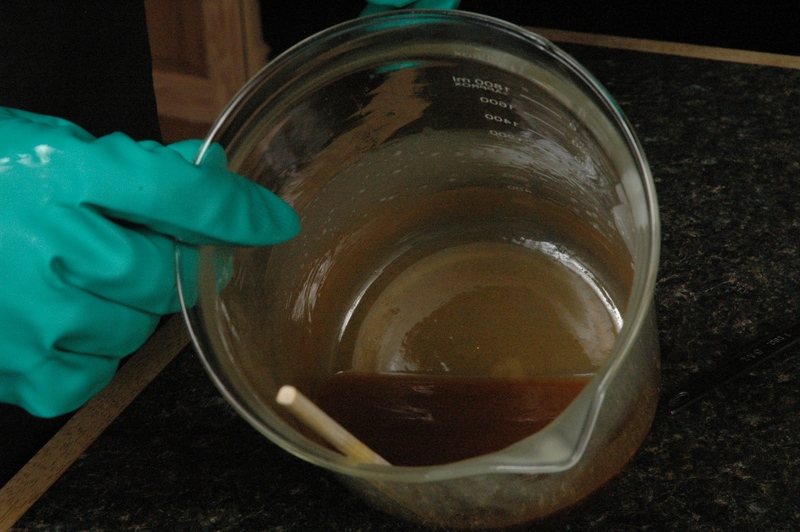 Completely melted oils ready for lye solution. 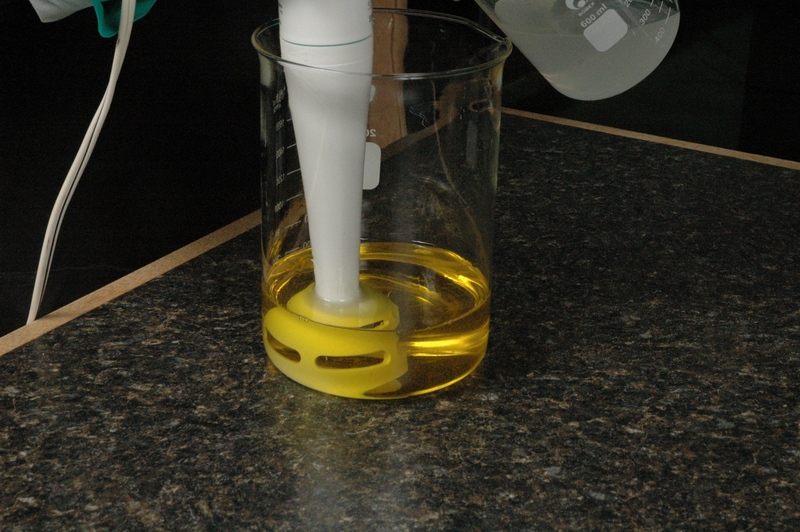 Blending oils and lye solution together. Reserving some soap for the Rose Hip Powder. Rose Hip Powder thoroughly mixed into soap. Pour the Rose Hip Powder soap in swirls. 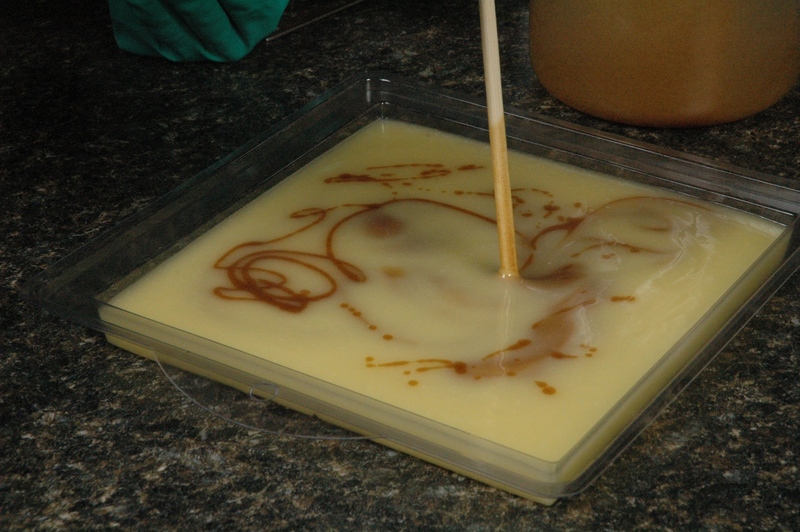 Using the stick and swirling into the corners of the mold. 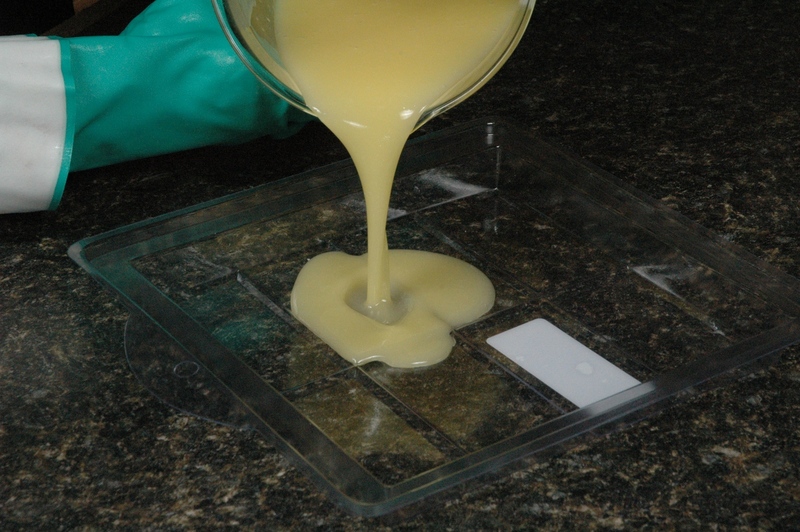 Pouring soap into the prepared mold. Adding Rose Hip Powder to reserved soap. Starting to pour Rose Hip Powder soap into the mold. 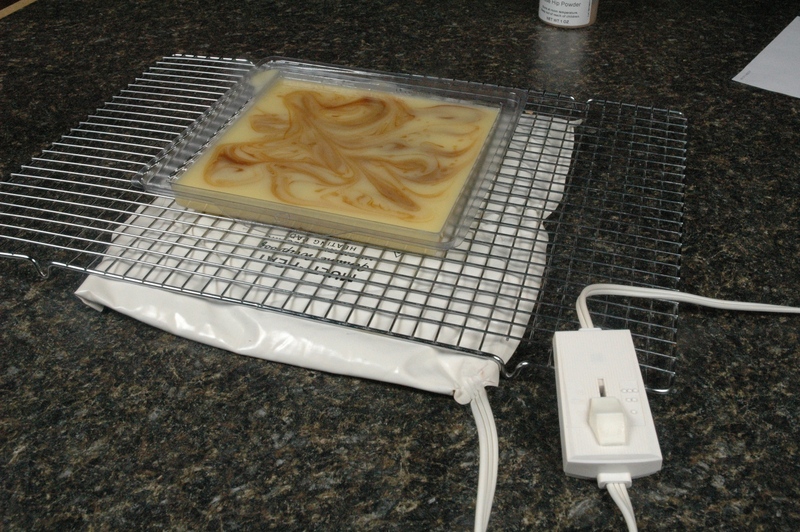 Soap sitting on the heating pad over the cooling rack. I had never thought to use a heating pad to keep shallow molds warm!!!!! Is the Rose Hip Powder available in your catalog? Yes! The Rose Hip Powder is available in our catalog. It’s in the Botanicals section. I always insulate my CP soap and it seems to have so much heat on its own, I never would think to add the heating pad. Is there some factor I am overlooking? It sounds like your soap is working just fine. The request for this batch of soap was a shallow mold, so the soap needed the extra heat from the heating pad to move through the heating process. You aren’t overlooking something. Your soap is probably deep enough and has the extra insulation you have given it to move through the heat process without the extra help from the heating pad. The mold can be rather flimsy, but you can CAREFULLY move the mold to the rack. I like to have the rack on the counter next to my mold and then I slide the mold onto the rack. Once the mold is on the rack, I can move my soap anywhere I want. You can do this any way you want. The Rose Hip Powder does not have a scent. It is mostly used for the light exfoliating properties and and the coloring it can give soap. Can’t wait to see the cut bars!